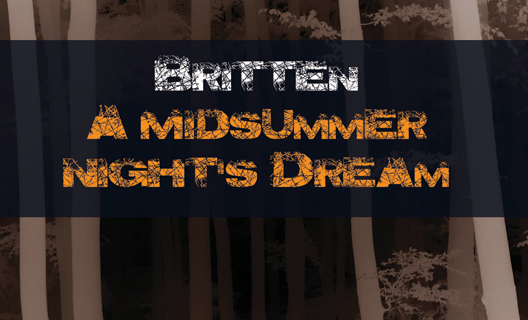 The last outing of Britten's Midsummer Night's Dream on the London opera stage seemed to be more concerned with the composer's sexuality than with his witty masterpiece based on Shakespeare's play (May 2011, English National Opera). Once bitten twice shy, thus one could be forgiven for being slightly worried about other productions to follow. However, fortunately the current staging of this opera by the Guildhall School of Music and Drama at the Barbican Theatre is tasteful, meaningful and entertaining. There is an arguable link between the two productions: for his ENO's staging Christopher Alden has placed the plot in a boys' boarding school while for his Guildhall production stage director Martin Lloyd-Evans just hints at the possibility of a boarding school at the opening of the opera. Or perhaps we are simply in the land of fairies – as specified by the libretto – and the young fairies share their dormitory in the forest. The young fairies – that is, the children from the Haberdashers' Aske's Hatcham College – are splendid. They sing well, they act well and they play the recorders in the exposed stage band well. Top marks to the Guildhall for working with such a splendid state school: surely this is education at its best all round. I must admit that I would have loved to have the four older fairies (Cobweb, Pleasebossom, Mustardseed and Moth) represented by young boys, as Britten clearly specifies treble voices. However, the tasks are substantial in these roles and practical considerations may weigh towards older sopranos replacing the young trebles. The four Guildhall students – sopranos Alba Bosch Teixidor, Faustine De Monès, Iria Perestrelo and Laura Ruhi Vidal – look, act and sound deceptively young (and play their cymbals and woodblocks in the fairies' stage band as experienced orchestra players). Perhaps with the exception of one singer, any of the first night's cast could walk onto any of the world's famed opera houses to deliver their roles. (There is a double cast which alternates during the four performances). Indeed, some of these singers could be regarded as role models in their parts. Barnaby Rea is splendid as Bottom: his vocal control, musicality and acting ability (including body language in his role as the donkey) are very impressive. Rea alternates with Ciprian Droma (Theseus on the first night) during the four performances. Droma's particularly clear diction in his portrayal of the Duke is exemplary. The alternating double casting for Rea and Droma as Bottom and Theseus is an inspired idea, although one must hope that the Guildhall has additional singers covering these roles. Eleanor Laugharne is a very strong Tytania; her vocal technique is rock solid. She effortlessly tackles Tytania's difficult flourishes and big leaps to the top notes (for example, towards the end of Act One) and she is fully convincing dramatically. Tom Verney is a slightly underpowered Oberon. This was particularly evident in the first appearance of the fairy King and Queen (following the March, Act One). Arguably it is harder to project for a counter-tenor (Verney) then for a soprano (Laugharne), although counter-tenors with strong projection are not unknown. However, Verney – a former choral scholar in Cambridge – is yet to start his opera course at the Guildhall, thus he may soon master the art of projection. Jorge Navarro-Colorado delivers a hilarious but tasteful rendering as Flute in the character of Thisby ('Pyramus and Thisby' that is the play in the play, Act Three). Alexander Knox is suitably acrobatic and projects strongly in the speaking/acrobatic role of Puck: surely the role, especially delivered at such high standard, is a feather in the cap of this MMus vocal student. Stuart Laing (Lysander), Kathryn McAdam (Hermia), Ashley Riches (Demetrius) and Sky Ingram (Helena) fully convinced as the troubled Athenian lovers but praise is also due to the rest of the cast: James Platt (Quince), Joseph Padfield (Snug), Hadleigh Adams (Starveling), Luis Gomes (Snout) and Catherine Backhouse (Hippolyta). Although we can quess, it is not entirely clear why director Martin Lloyd-Evans concludes Act One with Puck replacing Tytania in the arms of Oberon. However, this slight hint towards affectionate male bonding between Oberon and Puck – or between Britten and his children? – is gently understated. Lloyd-Evans stays within the boundaries of good taste even within the play in the play, thus raising 'Pyramus and Thisby' to the level of genuine entertainment. Unlike far too many stage directors, Lloyd-Evans clearly considers the music as well as the libretto. Using four pillows as props, the fairies gently coax the four Athenian lovers to lie down and sleep ('On the ground, Sleep sound', conclusion of Act Two): text, music and stage action are in perfect unity. Such ensemble work is present throughout Lloyd-Evans' staging. Conductor Stephen Barlow treats Britten's score with evident respect, love and skills. He presents the four different elements in Britten's writing (that is music for the fairies, for the Athenian lovers, for the rustics and for the bel canto parody of 'Pyramus and Thisby') yet he delivers the whole without fragmentation. The noble beauty as well as the sparkling humour of Britten's score is clearly manifested in Barlow's interpretation. One wonders why we don't hear more of Barlow from major opera houses. Guildhall's student orchestra sounded as one expects from an experienced professional band. On the other hand, the programme notes are restricted to the synopsis of the libretto and to biographical details concerning the actual performances. Why not include a piece about Britten and about this opera? However, the professionalism on the stage and in the pit is exemplary. Don't miss it.